Update, February 14: Blizzard have a PTR update ready just in time for Valentine’s Day. The latest Overwatch PTR is live, bringing with it many of changes we saw accidentally deployed to the live game alongside the Year of the Dog update. That includes some significant changes to Sombra, and smaller buffs for Doomfist and Mei. There’ve been some significant nerfs to Mercy recently, but you probably shouldn’t be freaking out about them. Sombra’s changes look pretty similar to how they were detailed last week, but here are the specifics of how they’re looking in the full PTR update. The developers say the idea is for Sombra to be less dependent on teammates using hacked health packs to build up her ult charge. This means the ultimate will come up less often, but the other changes should make it more effective when used. In the end, it should make Sombra more effective without relying on the ult ability. Doomfist’s ammo recovery rate is getting faster, icnreasing from 0.8 to 0.65 seconds per bullet in an attempt to make his weapon a more consistent part of his combos. In an accompanying developer update video, Jeff Kaplan also provided some further information on the Hanzo changes we’ve been hearing about. Abilities like Piercing Arrow didn’t make the cut, but they’re experimenting now with an ability that would give Hanzo a window to shoot several arrows in rapid succession, in addition to a horizontal leap allowing him to quickly disengage. As noted, Symmetra is on the list for further changes, but those are likely to be quite significant and require further time in the cooker. Torbjorn is also on the list for enhancements to make him a more viable part of regular play. 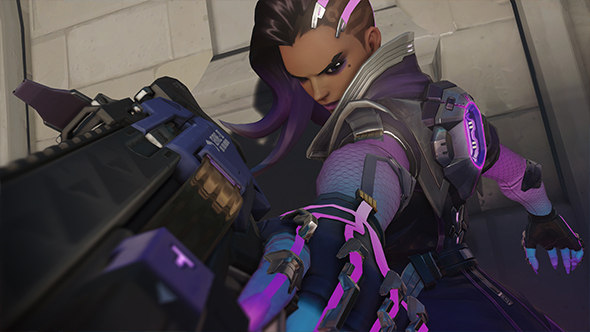 Original story, February 9: A few unexpected extra changes snuck out alongsideyesterday’s patchfor Overwatch, including some buffs for Sombra. These changes weren’t meant for the live game just yet – and have since been removed – but they do serve as a preview of what’s coming down the line in the new PTR. Principal designer Geoff Goodman confirmed the plans on the Battle.net forums, and detailed exactly what to expect. The plan is to bring down the power of Sombra’s ult while making the rest of her abilities more widely useful. This patch is set to hit the PTR “soon,” and we’re also expecting some balance changes for Mei, since the mistaken update saw the ammo cost for her icicle shot reduced from 25 to 20.